Instant Cash Canada Provides The Convenient Way To Get Funded Quickly! Are you struggling with a financial emergency in Oshawa? Are you finding it difficult to decide what to do in this situation? 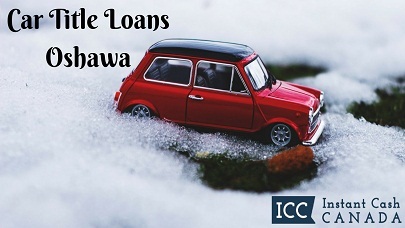 Contact Instant Cash Canada today and get the best car title loans Oshawa! We use your vehicle’s clear title as loan collateral in exchange for cash. The applicant must be of legal age. Must own a vehicle with less than 170,000 km driven and is no older than 10 years. Provide proof of permanent residency. Must have a valid Canadian driver’s license. Vehicle registration and insurance must be in your name. Valid insurance with collision deductible. The second set of keys to your vehicle. Check Out The Amazing Benefits Of Our Auto Title Loans Oshawa! We do not perform any credit checks or job verifications because our loans are based on your vehicle’s value and condition; not on your credit! Your vehicle must be fully paid in order to be eligible for the loan. We don’t hold on to your vehicle and you are allowed to keep driving it for the entire duration of the loan! Hassle-free repayment plans are easy and can be easily managed without causing major problems. So, you can pay off your loans at any time with no early payment penalties! Our loan terms can also be up to 4 years in length and have monthly payments as low as $97 per month. To Submit Your Online Application Without Having To Leave The Comfort Of Your Home!